David Simmons is a Lecturer in American Literature, Film, and TV at the University of Northampton, UK. He has published extensively on twentieth-century American popular culture. His books include The Anti-Hero in the American Novel: From Joseph Heller to Kurt Vonnegut, New Critical Essays on Kurt Vonnegut, and Investigating Heroes: Truth, Justice and Quality TV. 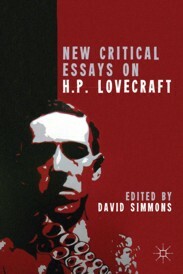 New Critical Essays on H.P. Lovecraft. Edited by David Simmons. New York, NY: Palgrave Macmillan; 2013; ISBN 978-1-137-33224-0; hardcover; 280 pages. This book may be purchased in hardcover from Amazon.com or Barnes & Noble or directly from the publisher, Palgrave Macmilla.